Nostalgia is a big deal in the video game world. What it is, in essence, is a longing for something in the past. Some experience or some sort of memory that triggers a little spot in our brains that brings us some old school bliss. We experience these sort of events sometimes on a daily basis. It can be memories of exes, hanging out with friends at a local sporting event, or, in most Zelda fans’ cases: video games. We all know this feeling all too well. Maybe for you it’s the old Sonic games, Final Fantasy 7 or Duke Nukem. We get this sort of feeling around what were great, fun, entertaining games back when we first experienced them. This is ever true in the Zelda franchise. Of course, this isn’t to say these games, and Zelda in particular, are bad games today, but nostalgia does tend to take something and make it seem like it is better than it really is by today’s standards. So, how exactly does this affect the Zelda franchise? For starters, the entire Zelda formula is virtually based on the nostalgic feelings of previous titles. Again, not to say the games are bad, but by today’s standard the formula itself is weak and stale. Princess is captured, go save her, and by doing so, save the land. We see this concept in frequently in the Mario series, but then we also see this concept at the next level in other adventure games like Oblivion, Dragon Age, and even the Fable series. It even goes into the actual design of the game itself. When Ocarina of Time was made, everyone praised it. In fact, we still do—and rightfully so. It was a catalyst for 3D adventure and RPG-related gaming back in the late 90s. Even still, did it really break the Zelda formula? 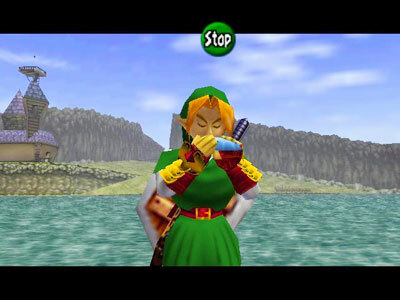 For those of us that played A Link to the Past before it, Ocarina of Time felt exactly like a 3D A Link to the Past. Everything about the game screamed the games before it. It felt wonderfully epic, experiencing something I had before in a new 3D environment. It was breath taking, but it wasn’t exactly a completely new concept. Fast forward past Majora’s Mask, The Wind Waker, and even Twilight Princess and Phantom Hourglass. In just two weeks, we will be getting a new title called Spirit Tracks. Some of what is exciting people the most are story line arcs which directly reference past titles—things that give off this warm feeling because those similarities and homages bring back memories. They add a nostalgic feel to the game itself, which ultimately means even if the game isn’t all it’s cracked up to be, we’ll still probably enjoy it. The greatest example of nostalgia’s effect on the Zelda franchise, however, still floats around Ocarina of Time. Outside of the fact that every 3D title since (save Majora’s Mask) follow Ocarina of Time’s formula, it is also what keeps the game itself at or near the top of every “best game of all time” list. In essence, Ocarina of Time was a good game at its time. Still, all the 3D titles since have been better games than Ocarina of Time ever was. Yes, this means Twilight Princess and The Wind Waker are, in fact, better overall games then Ocarina of Time. This isn’t to say nostalgia is bad. A game like 3D Dot Game Heroes is a great example of creating excellent nostalgic kick backs to the Zelda franchise in order to garner future sales. It’s a good method and, yes, can make games more enjoyable for me personally. Still, nostalgia does tend to make games seem better than they really are today. An example outside of Zelda: Tecmo Super Bowl was an amazing football game on the NES, but today’s Madden series totally blows it out of the water. I can come up with numerous examples, but I think the point has been made clear. Nostalgia is great for us long time gamers, but doesn’t really effect if a game is actually good or not. I have had friends who started on Twilight Princess and then went back to Ocarina of Time and couldn’t handle it. Controls were comparatively clunky, story was slow moving, and nothing really grabbed and pulled them in. I still enjoy Adventure of Link, Ocarina of Time, and Majora’s Mask... but they haven’t really aged well. Nostalgia keeps them as my favorite games, but I’ve seen better today. Zelda Wii could potentially to break this mold to some degree down the line, so here’s to hoping Nintendo can create a new era of nostalgic feelings for me. That way, 10 years from now, I get these same feelings of greatness from Zelda Wii that I do from Ocarina of Time today.